This tiara that the current duchess often wears to these events was first worn by the duke’s mother, Maria Francisca. She was actually a member of the Brazilian branch of the Portuguese royal family, and her marriage to Duarte Pio’s father reuinted the two lines. 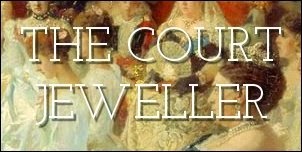 She married in 1942, and the design of the tiara suggests that it may also date to the middle of the twentieth century. It’s a small diamond bandeau that features floral elements interspersed with twisted diamond bands. Today, Isabel wears the piece both as a small enclosed circlet and as an open bandeau, the same way that her mother-in-law wore the tiara. It’s a small piece, considerably smaller than the heirloom tiara that Isabel wore to her wedding, but I’ll wager that this one is easier both to wear and to travel with. Recently, Isabel gave an interview in which she hinted that family jewels like this one, which the Braganzas own personally, might be passed down to their daughter. That would mean the further dispersal of the collection -- something that will no doubt dismay Portuguese monarchists, but unfortunately something that isn't uncommon when a royal family is no longer reigning.